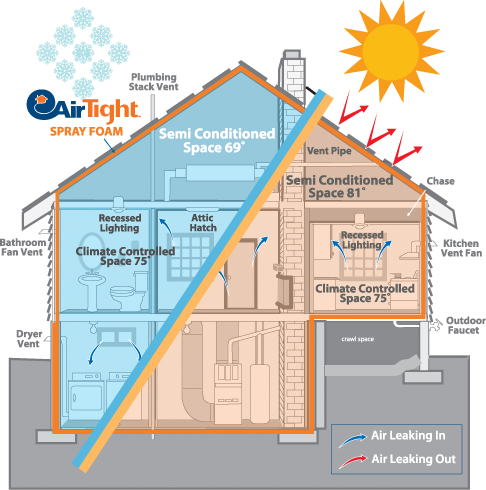 What Is An Airtight Home? Insulation should add value to energy savings, indoor air quality, safety, durability and comfort. AirTight SprayFoam insulation is designed to meet all of these demands. With the addition of AirTight SprayFoam, homeowner’s gain “peace of mind” that their home delivers maximum protection against energy loss and maximum comfort for their family. A blower door test is used to help determine the “AirTightness” of a home. How they work – A blower door is a powerful fan that mounts into the frame of an exterior door. The fan pulls air out of the house, lowering the air pressure inside. The higher outside air pressure then flows in through all unsealed cracks and openings. This test determines the air infiltration rate of a building. An effective way to determine the heat loss or gain in a building envelope is by using thermal imaging photography. Thermal imaging identifies leaks where air may be entering or exiting a building by displaying warmer areas with a distinct RED color, as it stands out against cooler areas. Airflow through cracks and holes in the walls, ceiling and floor is referred to as air infiltration. In addition to the use of spray foam, air infiltration is minimized by caulking and sealing the building envelope. A home that is not sealed for air infiltration will be uncomfortable due to drafts and will use about 30% more energy than a well sealed home. Controlling air infiltration is one of the most cost-effective energy-efficiency measures in modern construction practices. Spray Polyurethane Foam Insulation can be used in two common ways to insulate your attic space and protect your home from in climate weather and moisture related damages – Vented and Non-Vented Attic spaces. In a Vented attic, insulation is used on the attic floor to insulate the living space from seasonal heat and/or cold. Spray foam is used where traditional insulation would be; between the floor joists. The rest of the attic (ie: the roof assembly) is left un-insulated and ventilation is incorporated into the gable, soffit, and ridge vents throughout the roof structure. In a Non-Vented attic, insulation is applied directly to the underside of the roof sheathing to insulate the entire attic from seasonal heat and/or cold. Spray foam is installed between the roof rafters, along the soffit areas and directly to all exterior surfaces such as gable walls, dormers, etc., to produce an air tight building envelope. Home energy upgrades are more affordable today than ever before. Programs such as Home Performance with Energy Star, and others, are paving the way for homeowners to better afford home energy upgrades. With 10 year unsecured financing, many retrofits can be cash flow positive to the homeowners budget from day 1. The energy savings of 30%-50% on average, will typically offset 75%-100%+ of the monthly cost of the project.